The BoBunny Blog: Focus on Enchanted! 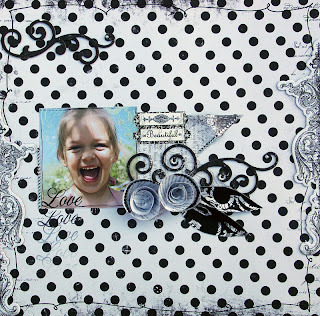 Debbie created this stunning layout by picking out the colors in her photo and using them as the accent color with the black & white papers, chipboard and stickers. 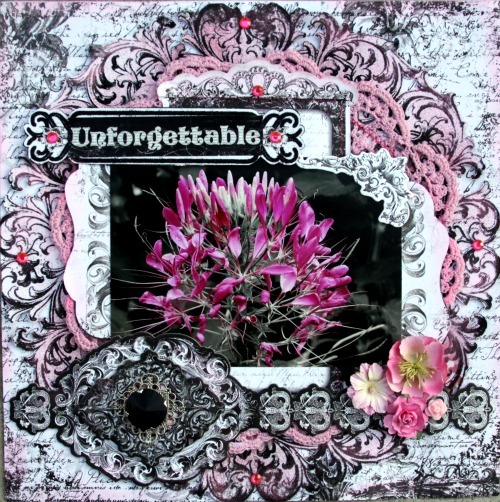 One of Sandra's favourite things in this collection is the gorgeous Trinkets, she used them along with some blooms and flourishes to create this elegant canvas. 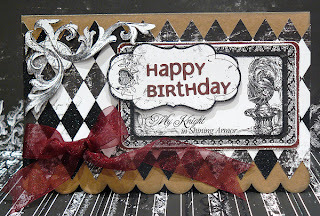 I love the way Carin did a little fussy cutting with one of the flourishes in the patterned paper to create a sophisticated looking embellishment for her card. Agnieszka created this fresh and pretty page by using the lovely dot patterned paper and adding flourishes in a few key places on her page to create a clean and fun design. Aren't these beautiful projects? What is your favourite part of the Enchanted Collection? We love to hear what inspires you! 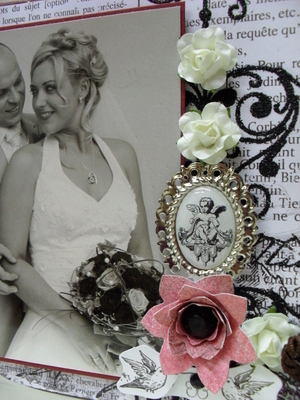 I am using the Enchanted line for my daughters wedding album and mini album. I love that you can use this with any color, and everything just matches so well. Enchanted is one of my favorite lines! (I'm taking up your facebook page posting them all, lol). Great diversity in this line. Very nice projects. Beautiful projects. My wedding is in June & can't wait to scrap it! Thanks for sharing! I really love Carin's "Knight" card - beautiful! I bought everthing in this line and look forward to using it. Thanks for the ideas! My favorite part of this line is the dramatic effect of the black and white. Gorgeous projects! One of my favorite Bo Bunny collections ever!!! I love how versatile this line is. Black and white - sophisticated. fun. cool. elegant. retro... whatever you want it to be! I have use the enchanted line in 3 home decore projects. I'm using it for my sisters wedding album, I'm addicted to this paper collection lol. I love using it with distress inks the glitter on the paper acts as a resist and I spray with some glimmer mist the effect is awesome. Gonna have to buy some more. WOW! i love this line! 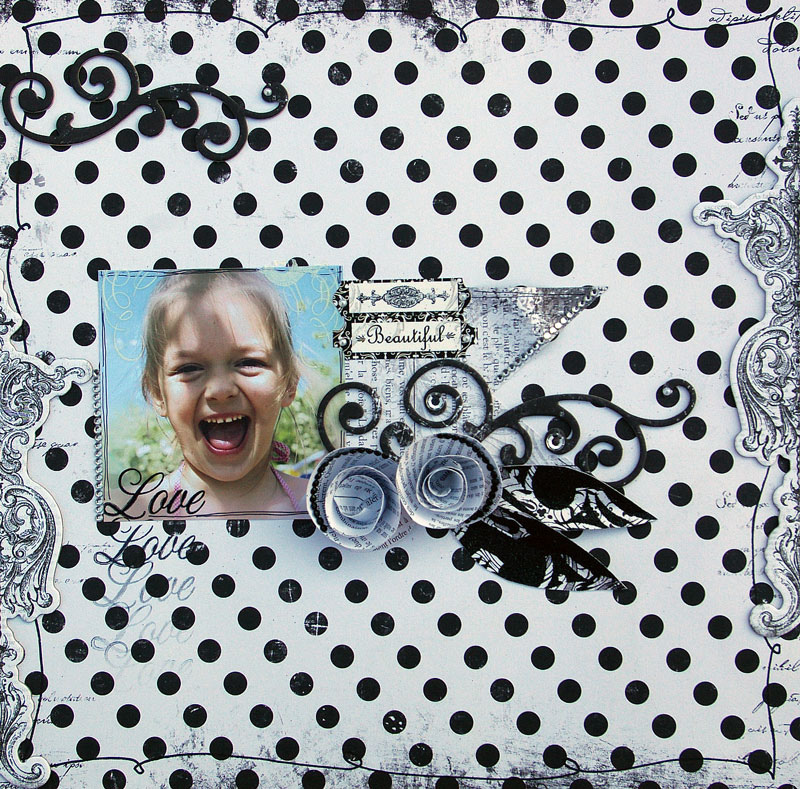 I have done four of my favourite layouts in the last month - all using Bo Bunny Enchanted. I have put them on the Bo Bunny Facebook wall.